A Staffordshire-wide service which is enabling older and disabled people to continue to live in their own homes has won a national award for innovation. 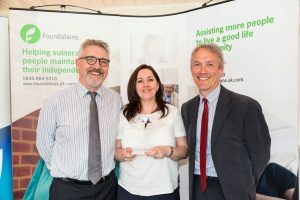 The success of the Revival service, provided by the Staffordshire Housing Group, was recognised at the Home Improvement Agency and Handyperson Awards. Revival offers a repairs and adaptation service to householders across nine Staffordshire local authority areas. More than 4,000 people are eligible to receive help from Revival, including older home owners, people on low incomes and disabled people. Revival has been helping people in North Staffordshire for several years with adaptations such as grab rails, stair lifts and easy access showers. The service was extended to include the whole of Staffordshire in 2014, following a partnership with Staffordshire County Council and all 8 of the District and Borough Councils in the region to reshape the service to help local people be healthier and more independent and feel safer, happier and more supported within their community. It won the Innovative Approach to Design and Delivery Award at a ceremony held in the House of Lords. The awards recognise excellence in housing support services.